Got a gif animated image but you're worrying because you're not happy with the size of the current image? so you need to resize the image. If this is the case then just relax and it is not to worry any more because we are here to give you some online free tools that will let you resize gif's online for free. As you know that there are lots of online photo editors and free online photoshop that let you edit pictures(of other formats) online, even few let you edit and resize static gif's but they may have no allowance of resizing gif animated images. So keeping that in mind, Tech Web World is here to collect and bring the list of best and free online gif resizer tools in order to resize your animated gif's easily and quickly within your browser. 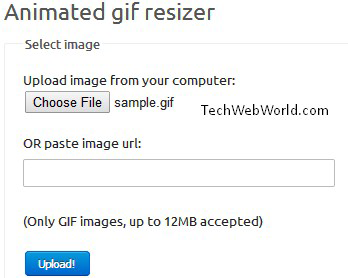 Why You Should Resize GIF animated Image Online? Resizing of an animated gif can also be done with a software as someone may find but first, I don't think there should be a freeware software, even if you find one. but this will still take downloading & installing process from you which is a time-consuming task. On the other hand, if you want to resize a gif image online, then you don't need anything to install. What you've to do is to go to that website, upload your image which you want to resize and then resize the image by entering the required height & width, the next step is to download resized image. Well, please have a look at the below list of tools that we organized after making a research on these. We used all of the below websites in order to justify, whether these are really easy or have some difficulty. During this time we notices something good and bad about everyone. That's why we'll be adding a short description to each to let you easily pick up the one you think is the best for resizing your animated images. TIP: you can also use photoshop online for gif resizing. This is one of the most popular on the web for gif editing and has an easy to use interface. The tool works fine and you can resize your image more quickly with this tool. In order to resize a gif. you'll be given two options i.e Upload from computer or enter a URL of the gif image that you want to resize. After clicking on upload button after selecting your image, the new page appears with the live preview of the uploaded image and detects its height and width. Below it. you will be provided two boxes where you have to enter the height width of the new resized image. So visit EzGif to do it yourself. GIFmaker is a very useful tool & web-app for those who're looking for an animated gif editing tool. Here we will be making use of this tool to resize a gif image to our required dimensions. After landing on this "GIFmaker", you will see a black button "Upload Image". So after selecting an image from your computer, see at the right side 'Control panal'. 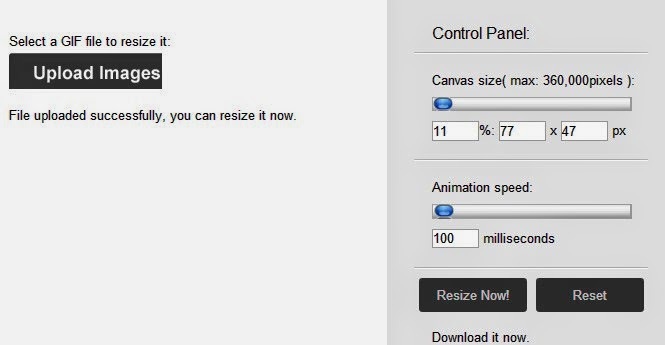 From there you can change the size of the image you uploaded as well as the animated speed. Size and speed can be managed by moving the convas to the desired dimension. After moving to the satisfactory pixels, click on "Resize Now" button. You will see a download link, click on it to download the resized image. You can also make use of picasion in order to resize your animate images online. Few good things about this is allowing you to upload images either from your computer, URL, From your flicker gallery, Picasa etc. Thus in case you've your photos there, you don't need to download and upload it again. visit http://picasion.com/resize-gif/ and start resizing your gif's online. Looking the name of the website, someone may have in mind that you've mentioned the wrong source, but no, SmilyGenerator can also be used as an online gif resizer. I found it very useful and for resizing an animated as it allow you to resize your your gif images manually by uploading your file and then entering your desired width and height. GIFmagic can also be used for the desired resizing. You can visit GIFmagic to upload your image and then can resize it by clicking on "zoom in" or "zoom out" buttons so after getting a satisfactory sized image right click on image and download to your computer. For those, who have more animated picture that they want to resize on daily basis, we've found a totally freeware software so they will be able to resize their image quickly without opening a website and uploading their images. 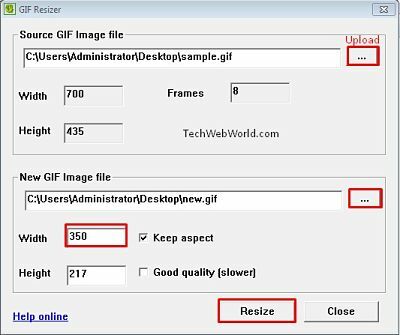 GIF resizer is a free software for your pc that can be used to resize your gif images on directly on your computer with an easy-to-understand interface. The tool has been build for windows OS. First download from this LINK. Run the downloaded program and select a gif which you want to resize. this will automatically detect the current height & width, Now enter the new height and width and click on Resize button to download your resized image in GIF format. So friends, in this post we shared the collection of web-tools that resizes your animated images online for free. I hope you liked the post and this was helpful for you. If it was really helpful for you then please share it on your social profiles and keep visiting our blog for getting more stuffs like this. Comments on the post online gif resizers are highly appreciated.... Feel free to leave a comment if you've anything to say about this post. Its really handy having to learn of the best free resize tools for GIF images. These tools are indeed handy when it comes to creating the perfect image for online optimization. Give or take, it becomes necessary to access what each tool has to offer so as to use it with peace of mind. In kingged.com, the above comment was where this post was "kingged"